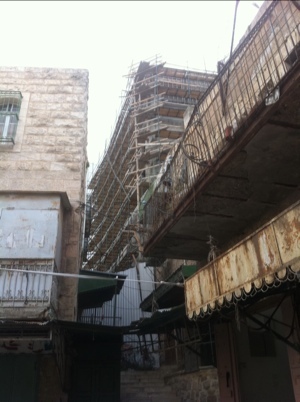 Walking through the Arab quarter in Hebron’s old city is an eerie experience. Bar the Israeli soldiers standing guard in watchtowers and on rooftops, the place is deserted. The shutters on the shops along what was once the city’s busiest street are permanently down. Some 10 years ago, during the Second Intifada, the Israeli government kicked out the Arab traders out on “security grounds’”. They had little time to leave and it’s said that many of the units are still filled with stock. At this heart of this mass evacuation, something all too common in the West Bank today, was and is a ploy to create illegal settlements for Israelis. In Hebron, a city of roadblocks and where Israeli citizens are separated from Palestinians, I saw today more of these developments in progress. This is not a way to achieve peace. Every time a new Israeli settlement is built life becomes more difficult for ordinary Palestinian families. Additional streets are closed and suddenly people find they can’t visit friends and relatives. Or they are forced to take less direct routes. In Hebron access is restricted to the Muslim cemetery, for example. 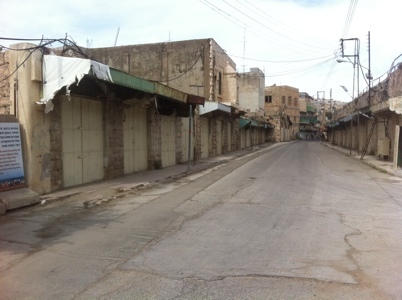 Even the parts of the Arab market in Hebron that are still open seem fairly quiet. 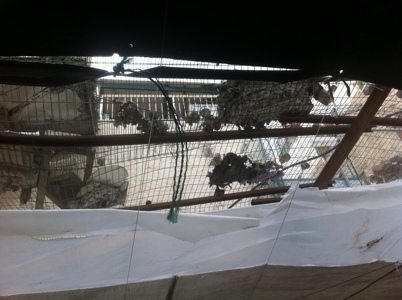 Settlers, who live above some of the shops, throw their rubbish and stones at passing Palestinians. While Palestinians are defenceless I saw with my own eyes today settlers that were armed with guns. The boundaries drawn following the Six Day war of 1967, and affirmed in the 1993 Oslo Agreement, was meant to mean that the West Bank would be a place for the Palestian people. But in the last 20 years settlement development has continued, perhaps now even at an increasing pace. There are today around 500,000 illegal settlers living in the West Bank by some estimates. And, travelling with a local guide, on the road from Bethlehem to Hebron today we saw that these are by no means small villages – they are fast-becoming towns in their own right with populations of up to 50,000. The land grab is gathering pace. The West Bank was and is meant to be for the Palestinian people. The Israelis have plenty of land they could legally settle on, but for some reason they choose to build homes here. And the Israeli government let the settlers get away with it. In fact they actually making it an attractive proposition, with military guarding their compounds and create exclusion areas around their homes. I even saw five, and in some cases 10, police officers standing watch at bus stops – snipers poised at all times, of course. The Palestinians by contrast have little protection, or indeed freedom. Their daily lives are controlled by the Israeli military. Soldiers stand guard outside the numerous refugee camps across the West Bank. Papers are checked and, if the Israeli military so decides, they are ‘locked’ inside their squashed compounds, barred from the outside world. Palestinians are already banned from Jerusalem, where many have relatives, and the rest of Israel. 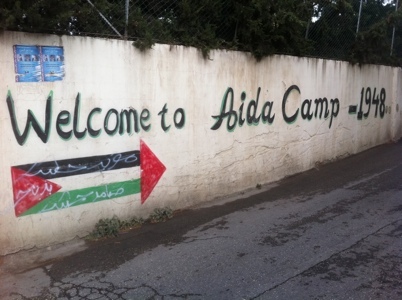 Earlier today I went inside a camp, the Aida Refugee Camp, in Bethlehem. When it was set up in 1948 people lived in tents, but over the years more permanent structures have been established, giving it it’s current appearance of that of a shanty town. 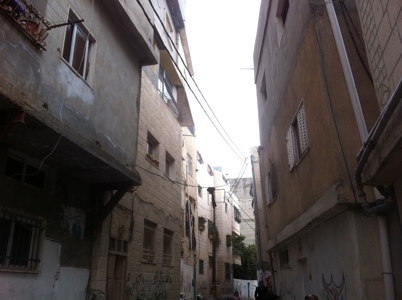 Although conditions are cramped (around 5,000 Palestinians live in an area less than 200 metres by 400 metres) inhabitants have access to running water for some of the day and children have schools in the district they can attend. But at the Lajee Centre, a place in Aida that campaigns for the local community, the manager told me about some of the problems that residents face, not least the night time raids that are made at the homes of families by the military. Often arrests are made, he says, and many will know someone who is languishing in an Israeli jail, without having been officially charged. Israeli military stand guard outside at the school, not to protect the children but to fire at them if they start throwing stones. Tear gas is also frequently used and I saw some of the canisters that were used outside the centre earlier this month. Just last week one of the workers was shot at by Israeli soldiers as he photographed them through an open door from the room where I today spoke to the manager. The victim is still in hospital, having suffered terrible burn marks to his face. Other in the Camp have died in recent weeks through confrontation with the Israeli military. Key to bringing lasting peace to the West Bank is for the settlement building to stop immediately. Benjamin Netanyahu, the Israeli PM, tells the world that he’s committed to a two-state solution, yet day after day he allows for new Israeli homes to be built on Palestinian land. God may have spoken about the Israel being the promised land for the Jews, and I respect that they have the right to live in peace in the Holy Land. But that doesn’t mean that others should be oppressed and forced out of their homes so that new settlements can be built. For 400 years under Ottoman rule Jews, Christians and Arabs lived alongside one and another. My hope is that this can one be a reality once again across Israel and the Palestinian territories, just like it is the case in Jerusalem. But until the separation barriers can be pulled down and travel restrictions eased for Palestinians, the settlement building must stop. Immediately.